The premise of the show is simple: two storytellers promise to summarize all books in the Harry Potter series in 70 minutes. However, numerous sketches, costumes and games make this anything but an ordinary reading. This is a two-man show, not counting the excellent lighting and sound technicians, so all of the characters are portrayed as basically the same guy in a different hat and with a different accent. I used to do improv, but I did not do anything nearly as impressive as playing over 10 characters an hour! To add to the pressure of mastering the nuances of each key player in Rowling’s universe, Dan and Jeff also have to incorporate the audience response into the show. This makes the performance interactive, which is especially important for the large number of children who typically attend, and also creates a sense of witnessing something unique, for no two shows are the same. 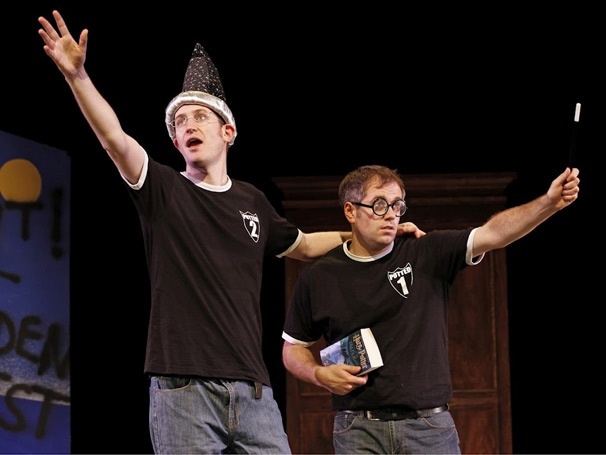 Potted Potter – The Unauthorized Harry Potter Experience is a fantastic way to spend just over an hour, whether you are a parent looking for something fun to do with your children or someone looking for an out-of-the-ordinary spectacle to witness before dinner with friends in DC. The production is the Lansburgh at Shakespeare Theatre until June 21.